Log Analytics is a service that collects telemetry and other data from a variety of sources and provide a query language for advanced analytics. 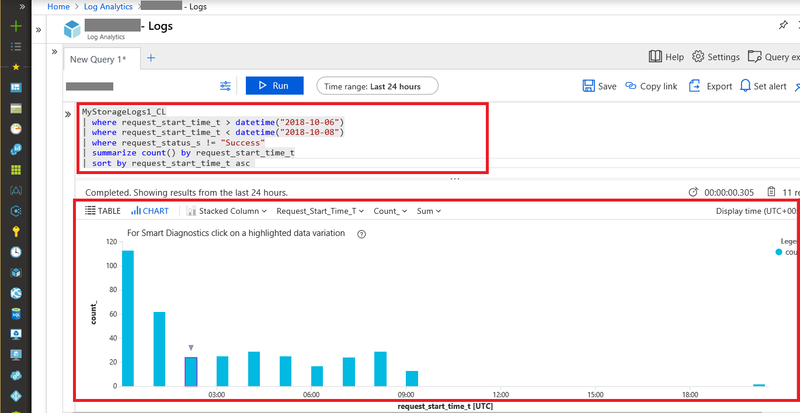 After you post logging data to Log Analytics workspace with HTTP Data Collector API, you are able to query logs for troubleshooting, visualize the data for monitoring, or even create alerts based on log search. For more details, see Log Analytics. 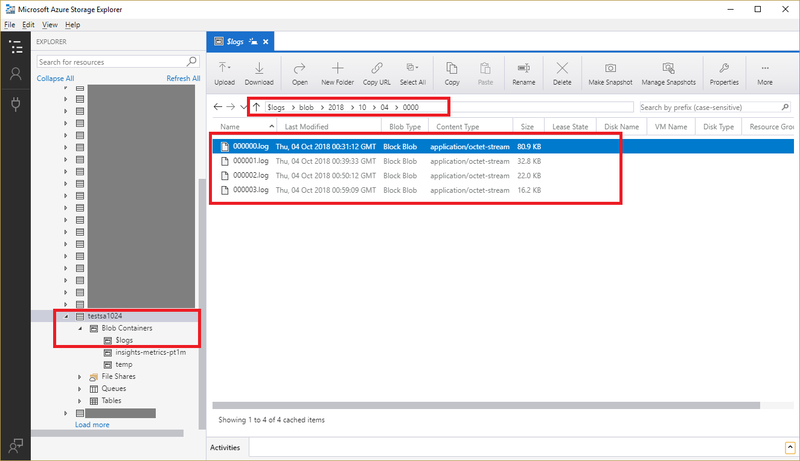 First, you will need to create a workspace in Log Analytics. The following screenshot shows how to create it in Azure Portal. 1.0;2014-06-19T22:59:23.1967767Z;GetBlob;AnonymousSuccess;200;17;16;anonymous;;storagesample;blob;"https://storagesample.blob.core.windows.net/sample-container1/00001.txt";"/storagesample/sample-container1/00001.txt";61d2e3f6-bcb7-4cd1-a81e-4f8f497f0da2;0;192.100.0.102:4362;2014-02-14;283;0;354;23;0;;;""0x8D15A2913C934DE"";Thursday, 19-Jun-14 22:58:10 GMT;;"WA-Storage/4.0.1 (.NET CLR 4.0.30319.34014; Win32NT 6.3.9600.0)";;"44dfd78e-7288-4898-8f70-c3478983d3b6"
Semicolon mark in the columns: Some columns like request-url or user-agent-header may contain semicolon mark. It should be encoded before split with semicolon. After split, it should be decoded back. Quote mark in the columns: Some columns like client-request-id or etag-identifier may contain quote mark. While adding quote mark for other key values, it should be ignored for these columns. Use the column definition as key name from Storage Analytics Log Format, so you easily query with them in Log Analytics. Examples: version-number, or request-start-time. Azure Log Analytics provides HTTP Data Collector API to post custom log data Log Analytics workspace. You can follow the sample code in the article to send the log json payload prepared in the last step. If you create record type like MyStorageLogs1 in posting logs, you will use MyStorageLogs1_CL as stream name to query. 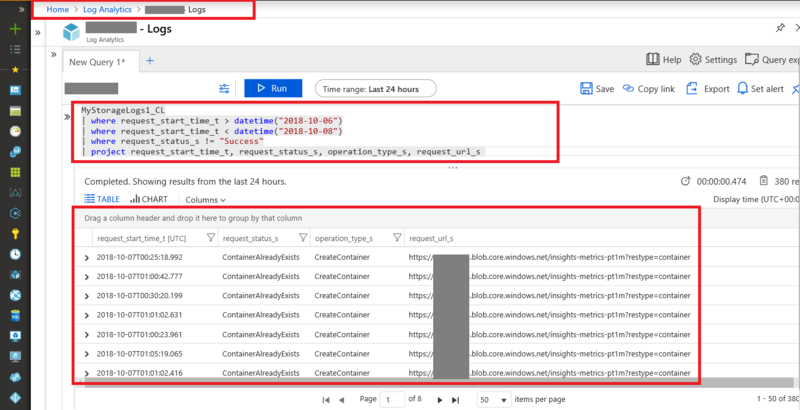 The following screenshot shows how to query imported Storage analytics logs in Log Analytics. A sample Powershell script is provided to show how to convert Storage Analytics log data to JSON format and post the JSON data to a Log Analytics workspace. 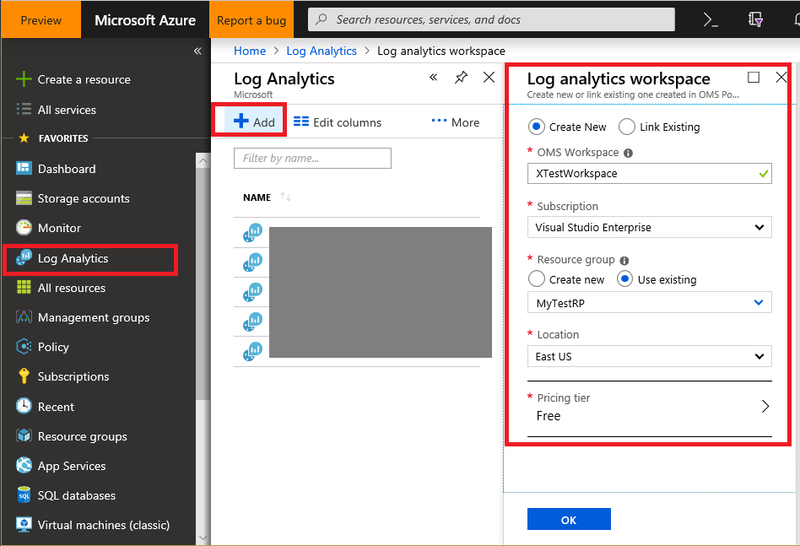 Read more to continue learning about Storage Analytics and Log Analytics, and sign up for an Azure create a Storage account. When you read log data from Storage account, there is a cost from read operations. For detailed pricing, visit Blobs pricing. Also note, Log Analytics charges you based on Azure Monitor pricing. Azure Storage is working with the Azure Monitor team in unifying the logging pipeline. We hope to have built-in integration with Log Analytics for Azure Storage logs soon, and we will keep you posted when the plan is determined. If you have any feedback or suggestions, you can email Azure Storage Analytics Feedback.